Stretching from the Mexican border along the Pacific for nearly 900 miles, California boasts spectacular natural landscapes and terrain. The Golden State is also home to some of the most luxurious resorts and hotels in the country, which promise unforgettable retreats. Surrounded by five acres of beautifully landscaped gardens overlooking Del Mar Beach, L’Auberge Del Mar is a luxury resort across the street from the popular Del Mar Plaza outdoor shopping mall, with direct access to the beach. 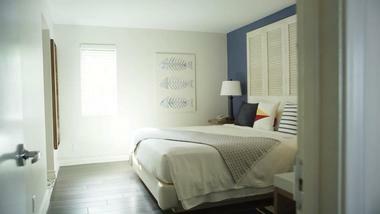 The rooms are bright and spacious, decorated in a beach casual and upscale chic style. 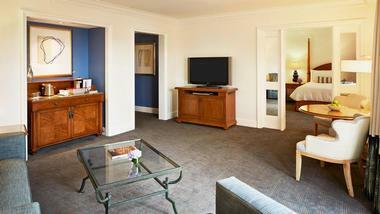 All are equipped with iPod docks, free Wi-Fi, and flat-screen TVs. 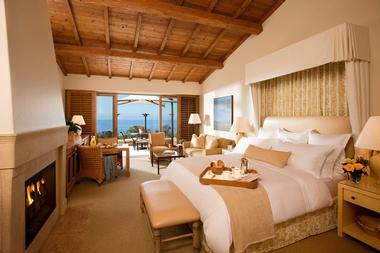 Many rooms have private patios or balconies overlooking the beach. Suites add living room areas with fireplaces and sofas. Guests enjoy two restaurants, a lounge that offers live music, a poolside bar, a spa, tennis courts, and a gym. There is a free shuttle to the nearby area. Set on 28 acres of scenic countryside in the Napa Valley, Carneros Resort and Spa is a chic, award-winning retreat with spectacular scenery and warm and welcoming hospitality and service. Inspired by the classic California lifestyle, this one-of-a-kind getaway is an hour’s drive from San Francisco and features contemporary cottages, suites, and fully furnished homes. Cottages have comfortable bedrooms with en-suite bathrooms, heated flooring, indoor and outdoor showers, wood-burning fireplaces, and French doors that open on private patios, while large family-centric homes have full kitchens and living areas that flow onto decks and gardens. Upscale amenities include a newly renovated spa, two swimming pools, an infinity-edged hot tub, three restaurants, bocce ball courts, a boutique store, and loaner bicycles for exploring. Surrounded by patchworks of rolling vineyards, Meadowood Napa Valley is a luxurious and romantic Napa Valley resort a few miles from the scenic Silverado Trail. The resort features cozy cottages, sophisticated suites and upscale lodges with comfortable beds dressed in goose-down bedding, living areas with wood-burning fireplaces, wet bars with mini-fridges, and coffeemakers, and private terraces with gorgeous views. In-room dining and spa services are available, as well as bottled water, and complimentary wireless Internet, while additional amenities include wine socials in the evenings, access to the outdoor swimming pool, fully equipped gym, and numerous hiking trails, and local car service. An acclaimed on-site restaurant and bar, and several casual eateries serve a variety of cuisine, which can be enjoyed alfresco-style or by the poolside. 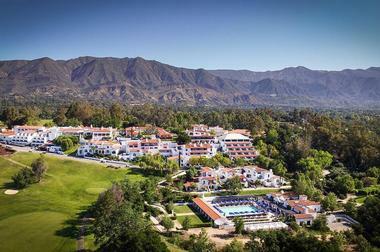 Located a few miles from the Los Padres National Forest, the Ojai Valley Inn is an elegant Spanish hacienda-style resort that has been providing loyal customers with refined accommodations, deluxe amenities, and award-winning hospitality and service for more than 85 years. The Inn features posh, contemporary rooms with designer linens and décor, living areas with fireplaces and kitchens, en-suite bathrooms with whirlpool baths, and modern amenities like flat-screen televisions with DVD players, and complimentary wireless Internet. Facilities at the grand inn include a luxury spa and wellness center, several fine dining restaurants and bars, a championship golf course, driving range and a putting green, and tennis courts. Guests have access to fully equipped business and fitness centers, and ample event spaces cater for special functions and celebrations. The Ranch at Laguna Beach is a beautiful resort within the heart of Orange County, located within the spectacular Wood and Aliso Canyons. 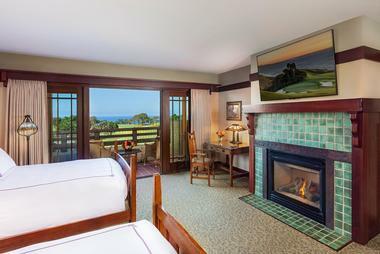 The 87-acre resort is the only National Geographic-designated Unique Lodge of the World in California, located conveniently near Aliso Beach Park and the Coast Highway. World-class accommodations are offered at the resort's boutique hotel, offering private furnished balconies and patios. The resort's Harvest Restaurant serves up specialty California cuisine at breakfast, lunch, and dinner, with in-room dining options available. Luxury spa services are also offered, along with a heated outdoor pool, nine-hole golf course, and sand volleyball courts. Exuding the luxurious style of a secluded Côte d’Azur retreat and the sun-drenched ambiance of Provençe, Auberge du Soleil has perfected the art of balancing wellness with luxurious indulgence. 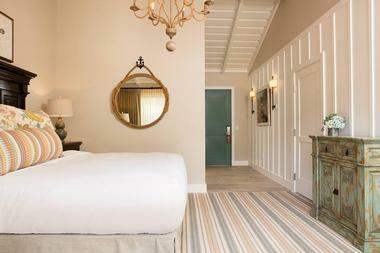 Boasting breathtaking Napa Valley views in a spectacular natural setting, the inn features a collection of beautifully appointed rooms and suites, featuring private terraces, cozy fireplaces and sensual elements such as private soaking tubs for two. The intimate retreat also offers the indulgent Auberge Spa, a gorgeous swimming pool and oversized chaises and gauze-draped day beds for lounging. Dine in style at the Michelin-rated Auberge du Soleil Restaurant where Executive Chef Robert Curry presents beautifully prepared, Mediterranean inspired Wine Country cuisine accompanied by some of Napa Valley’s finest wines. Set in a beautiful Spanish colonial-style building and surrounded by 22 acres of lushly landscaped gardens on the American Riviera, the Four Seasons Resort The Biltmore Santa Barbara is a luxury oceanfront resort just steps from one of the most beautiful beaches in California. Exuding the grace and charm of a bygone era, the elegant hotel features private bungalows and luxury suites with designer décor and private terraces that overlook the Pacific Ocean and the Channel Islands. Two award-winning restaurants serve globally-inspired Californian and Italian cuisine, and a casual café and poolside bar serve colorful cocktails and tapas. Two swimming pools and an exclusive spa offer pampering and relaxation, and a delicious buffet breakfast is served every morning. 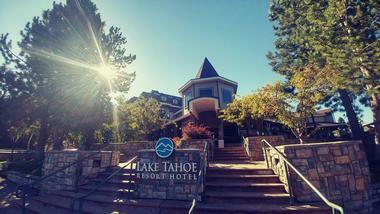 Lake Tahoe Resort Hotel is a lovely all-suite hotel located along the base of Heavenly Mountain Resort, which provides access to some of Lake Tahoe's best skiing and winter sport opportunities. The hotel, which is located adjacent to Harrah's Lake Tahoe Casino, offers 400 splendid two-room guest rooms and suites, which are equipped with modern amenities such as flat screen television, mini fridges, wet bars, microwaves, and free wireless internet. Separate living areas offer work desks and pull-out sofas, with hairdryers and toiletries provided in private bathroom spaces. All guests receive complimentary breakfast at the hotel's atrium breakfast buffet each day, with access to the hotel's indoor pool and fitness center offered for an additional resort fee. Guests can also dine at the American-style Echo Restaurant, which serves up delicious lunch and dinner entrees crafted from locally-sourced organic ingredients. Perched on a hillside in Dana Point overlooking the Pacific Ocean, Monarch Beach Resort is a Tuscan-style resort along Orange County’s sun-drenched coast. The AAA Five-Diamond award-winning sanctuary offers guests an array of exclusive activities and inspiring experiences that embody Southern California’s comfortable coastal lifestyle from therapeutic spa services and celebrated dining to championship golf links and water sports. Accommodations have comfortable beds with premium down duvets, luxurious en-suite marble bathrooms with rain showers and soaking tubs, and private balconies or terraces with spectacular views. A beautiful outdoor swimming complex has an adult lap pool, a children's pool and a lagoon pool with fully-outfitted cabanas, and the Monarch Beach Kids Club offers a children's program and babysitting services. Set on an oceanfront bluff overlooking Laguna Beach, Montage Laguna Beach is a luxe spa resort set in a beautiful craftsman-style building with stylishly appointed guest rooms and upscale facilities. Located just a short walk from Laguna Beach, the hotel features arts-and-crafts-style rooms and suites with dark-wood furnishings, regional works of art, marble en-suite bathrooms with soaking tubs, and private balconies with glorious ocean views. In-room conveniences include flat-screen televisions with DVD players, and complimentary wireless Internet, and luxurious facilities at the resort range from an exclusive spa with 21 treatment rooms, three swimming pools, an oceanfront pool with cabanas, an upscale restaurant and a terrace grill serving globally-inspired cuisine, and modern event spaces. Surrounded by the rolling hills and patchwork vineyards of the Napa Valley, the Calistoga Ranch is an upscale resort set on acres of beautiful landscapes and just a short drive from the Old Faithful Geyser in Yellowstone National Park. The high-end retreat features elegantly appointed cedar lodges with outdoor living rooms with fireplaces, en-suite bathrooms and modern amenities such as entertainment centers, and complimentary wireless Internet. Facilities at the resort include a private lake and vineyard, which are an ideal spot for walking dogs, an outdoor swimming pool, a fully equipped gym, an exclusive spa and a wine cave. An onsite restaurant serves delicious wine-country cuisine and has an outdoor deck with breath-taking views of the valley. 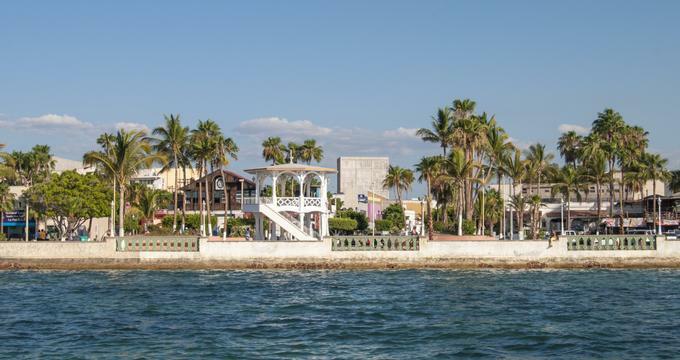 Set on a private island with beautiful white sandy beaches in the heart of Mission Bay, Paradise Point Resort & Spa is a stylish and sophisticated retreat with stylishly appointed bungalow-style guestrooms surrounded by 44 acres of lushly landscaped gardens and grounds. Located a few miles from the world-renowned SeaWorld, the resort features five swimming pools, an award-winning spa and wellness center, beach bonfire pits, five upmarket dining establishments, a championship golf course, and a modern marina. A wealth of outdoor recreational activities can be enjoyed from lawn games, basketball and tennis to a fitness center, golf, and water-sports, along with easy access to San Diego’s top attractions such as Old Town, Balboa Park, and the San Diego Zoo. Surrounded by 200 acres of rolling hillsides and verdant valleys along the shores of Batiquitos Lagoon on Southern California’s sun-drenched Pacific Coast, Park Hyatt Aviara Resort Golf Club & Spa is a study in elegance and refinement. Located in the stylish seaside city of Carlsbad with easy access to its many attractions, including Legoland and South Carlsbad State Beach, the resort features well-appointed traditional guest rooms and suites with marble en-suite bathrooms and soaking tubs, living rooms with modern amenities such as flat-screen televisions with Internet capabilities, and complimentary wireless Internet, and private balconies with spectacular views. A refined Italian restaurant, a prime steakhouse and a casual California bistro provide a selection of excellent dining options, as well as a laid-back lounge offering tapas and live entertainment. Additional guest facilities include an exclusive day spa, an outdoor swimming pool, six tennis courts, an 18-hole championship golf course, and a variety of children’s activities, including a day camp, games room, and babysitting services. Spread over 43 acres of flowering trees and olive groves, manicured croquet fields and champion-staffed tennis courts, Rancho Valencia Resort & Spa is a lavish resort with an exclusive spa and award-winning restaurant at its core. Set inland from the Pacific and surrounded by the Torrey Pines State Natural Reserve, the resort features a cluster of Spanish-style bungalows with designer décor and luxury linens, en-suite bathrooms with rain showers and soaking tubs, spacious living areas with modern amenities, and private patios with beautiful views. A secluded guesthouse adds a private outdoor pool and a hot tub for house wanting additional levels of luxury and privacy, and resort facilities range from a deluxe spa and fitness center, two heated swimming pools and hot tubs, and a variety of sports such as croquet, bocce ball, and tennis. Two elegant restaurants and a wine bar offer refined cuisine and fine wines from around the world, and luxury car rentals are complimentary. 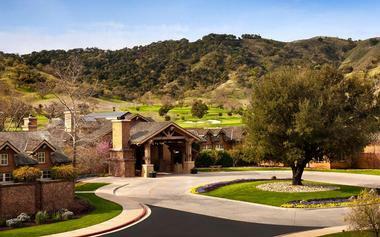 Nestled in the scenic wine country of the Santa Clara Valley, Rosewood CordeValle is a luxurious golf and spa resort located just seven miles from downtown Gilroy. The hotel offers charming, pet-friendly country-style rooms and suites with private bathrooms, whirlpool tubs, wet bars, and fireplaces. The hotel features an upscale Italian restaurant with lovely views over the valley, and a cozy bistro serving local fare. Deluxe facilities include a luxury day spa, a gym and outdoor swimming pool, business facilities, tennis courts, and an 18-hole golf course. Rosewood CordeValle welcomes pets with an array of services such as Rosewood CordeValle bedding for dogs, food, water, and doggy treats in the room, and dog walking and dog sitting services. 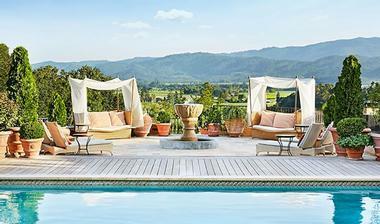 Set on 22 acres of pristine landscapes at the northern end of Napa Valley, Solage, an Auberge Resort is an eco-friendly luxury retreat with a 20,000 square foot spa and an award-winning restaurant. The loft-inspired resort features 89 studio accommodations with high-beamed vaulted ceilings, polished concrete floors, warm décor in local wood and natural fibers, and en-suite bathrooms with pebble-stone showers. 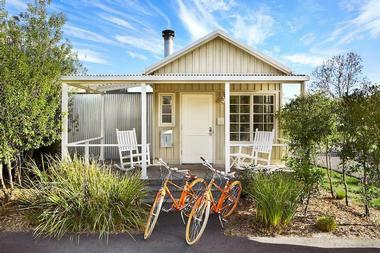 Complimentary cruiser bicycles are available at each of the studios for guest to explore the resort's native-landscaped grounds and the nearby city of Calistoga and the onsite Michelin star-rated restaurant, Solbar, serves a seasonally-driven organic farm-to-table menu bursting with local natural flavor. The restaurant has a stunning outdoor patio for alfresco dining in the summer and an inviting contemporary dining room with a fireplace for cozy winter evenings. 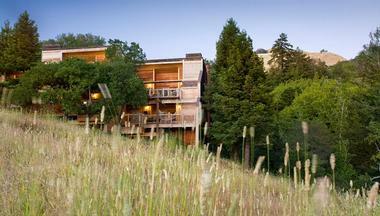 Guests can also enjoy yoga classes, mud baths, and soaking in a hot-springs mineral pool. Nestled on 102 private acres of California's secluded Palos Verdes Peninsula with breathtakingly scenic views of the Pacific Ocean and Catalina Island, Terranea - L.A.'s Oceanfront Resort is an elegant upmarket Mediterranean-style resort that offers an exclusive retreat. Luxurious accommodations range from guest rooms and bedroom bungalows to houses and villas, which are decorated in rich, natural hues and feature en-suite bathrooms with rain showers and soaking tubs, fully equipped kitchens, indoor and outdoor fireplaces, and private balconies or patios. Modern amenities include flat-screen televisions with cable channels, iPod docking stations, and complimentary wireless access, and guests can relax with an indulgent massage from the spa or yoga classes at the fitness center. A range of on-site activities such as kayaking, horseback riding, scuba diving, whale watching, and the hotel's Falconry program is available for guests to enjoy, as well as a nine-hole par-3 oceanfront golf course. Overlooking the renowned Torrey Pines Golf Course in La Jolla, the Lodge at Torrey Pines is a luxe resort hotel located a few miles from La Jolla's beautiful beaches. The hotel features well-appointed, polished guest rooms and suites with Mission-style furnishings, marble en-suite bathrooms, and in-room conveniences such as flat-screen televisions with cable channels, Bose sound systems, minibars, and complimentary wireless access. Private balconies boast breathtaking ocean or golf course views, and high-end facilities range from a stylish restaurant and a low-key bar and grill to a heated outdoor swimming pool, a hot tub, and luxury spa. The hotel boasts over 13,000 square feet of meeting space for special functions and celebrations and guests staying at the Lodge at Torrey Pines receive preferred tee times at the Torrey Pines Golf Course. Set on 504 acres of natural landscapes along the Newport Coast, the Resort at Pelican Hill is a luxury golf resort and spa with panoramic views of the Pacific Ocean. Offering 36 championship holes of golf, as well as a beauty and wellness spa with 22 treatment rooms, and stylish accommodations in the form of comfortable bungalow-style rooms and suites, and deluxe villas, the resort offers a relaxing getaway for every taste. An acclaimed Northern Italian restaurant serves delicious cuisine against a backdrop of spectacular ocean views, and a casual eatery with a heated terrace is ideal for alfresco dining in summer. 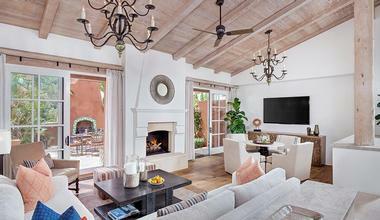 Accommodations boast 15-foot wooden beamed ceilings, cozy fireplaces, granite bars, and private patios, and upmarket villas have up to four bedrooms, butler services, and access to a private clubhouse and swimming pool. 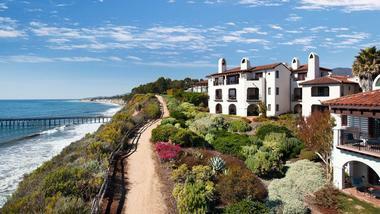 A perfect destination for those seeking relaxation, romance or adventure, the Ritz-Carlton Bacara, Santa Barbara sprawls across 78 acres of pristine landscapes and boasts breathtaking views of the Pacific Ocean. The luxurious retreat features two natural beaches, lushly landscaped gardens, and an exceptional collection of high-end amenities including a renowned day spa and fitness center, five restaurants including the signature Angel Oak, which houses a 12,000-bottle wine collection, and over 70,000 square feet of elegant indoor and outdoor event spaces. The hotel offers 358 beautifully appointed guest rooms and suites, each with a balcony overlooking the ocean or resort gardens and modern in-room conveniences, and a wide range of activities for guest of all ages, including in one of two oceanfront saltwater pools with private cabanas, tennis, fitness classes and gym sessions, and various water sports. 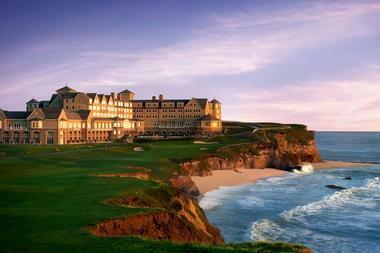 Perched atop a rugged ocean-side bluff on the Northern Californian coast, and situated just 30 minutes from San Francisco and Silicon Valley, The Ritz-Carlton, Half Moon Bay is an acclaimed 5-star, luxury resort that promises an unrivaled experience. Surrounded by two championship golf courses, the deluxe retreat features a full-service luxury spa, two fine dining restaurants, including the Cork Wine Bar, which offers an upscale wine bar experience with a collection of more than 5,000 bottles of wine, and an Executive Club Lounge, which features all-day food and beverage services and a full-service concierge. Beautifully appointed guest rooms and suites are decorated with coastal and beach-side accents and boast breathtaking ocean and mountain views. Other upscale facilities at the hotel include an indoor swimming pool, a fully equipped fitness center, and modern event spaces. 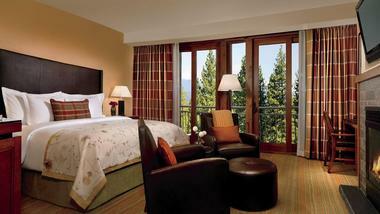 Nestled among pine trees in the ski village of Northstar on Lake Tahoe, the Ritz-Carlton Lake Tahoe is an elegant mountainside hotel with refined accommodations and premium facilities. Just a short drive from the Kings Beach State Park and Donner Lake, the hotel features refined guest rooms and suites with spacious living areas, fireplaces, marble en-suite bathrooms with walk-in showers, and balconies with spectacular mountain views. Modern in-room amenities include flat-screen televisions with cable channels, iPod docks, and complimentary wireless Internet, and room service is available 24/7. The hotel is also home to five restaurant and bars serving international cuisine and drinks, a classy lodge-inspired eatery, and a ski-in/ski-out patio with a barbecue, a high-end spa and wellness center, two outdoor swimming pools, and a fully equipped gym. 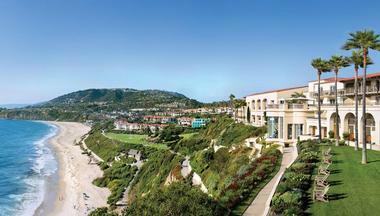 Set along the beautiful coast of southern California atop a 150-foot oceanfront bluff, the Ritz-Carlton, Laguna Niguel is an elegant Mediterranean-style hotel with spectacular views of the Pacific Ocean. Conveniently situated just a mile from the Monarch Beach Golf Links, the palatial retreat features soothingly sleek guest rooms and suites with modern décor in soft sea-toned hues and dark-wood furnishings, private balconies and patios with outdoor fireplaces, and in-room conveniences such as flat-screen televisions with cable channels, minibars, and complimentary wireless access. Upmarket facilities at the resort include a chic beauty spa with steam rooms and a sauna, tennis courts, two swimming pools, and two hot tubs, as well as yoga classes, a beach shuttle, and several restaurants, including prime steakhouse, an eatery serving Pan-Latin coastal cuisine, and an elegant bar and lounge. 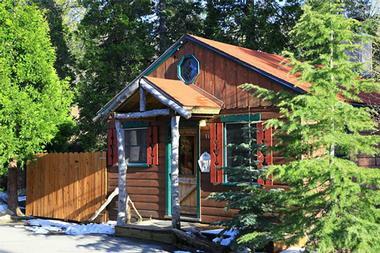 Surrounded by acres of pristine woodlands and forested valleys in Twin Peaks, Arrowhead Pine Rose Cabins is a rustic resort four miles from Lake Gregory and the Lake Arrowhead Village. The resort features woodsy studios and multiple-bedroom cabins with antique furnishings and local artworks, living spaces with fireplaces, kitchens and private decks with beautiful views. Luxury four-bedroom mountain lodges have fully equipped kitchens and barbecue grills, and modern amenities such as flat-screen televisions with cable channels, and complimentary wireless Internet. The resort has a seasonal outdoor swimming pool, a year-round hot tub, and a children’s playground, as well as several sports courts, table tennis, barbecue grills and picnic tables, several hiking trails, and a fully stocked library. Ventana Big Sur is a woodsy-chic resort surrounded by 243 acres of beautiful natural landscapes off the Pacific Coast Highway next to the Pfeiffer Big Sur State Park. Situated 30 miles south of Monterrey, the luxury resort offers plush guest rooms with private balconies, deluxe suites with fireplaces or hot tubs, and high-end villas with spacious living areas and multiple bedrooms. Modern amenities include flat-screen televisions with cable channels and DVD players, minibars, iPod docks and complimentary wireless access, as well as binoculars and walking sticks for exploring the magnificent surroundings. A delicious complimentary breakfast is served every morning, along with evening cheese and wine receptions, and a farm-to-table restaurant and bar offer healthy, organic cuisine in a casual setting. Additional facilities range from a clothing-optional swimming pool, dry sauna, and spa to a fitness center, daily yoga, and Tai Chi classes, and guided walks. Secluded, private, and distinguished, Casa Palmero at Pebble Beach is an elegant and romantic Mediterranean-style estate set along the first and second fairways of the famed Pebble Beach Golf Links in Monterey. This Mediterranean-style luxury boutique hotel combines elegance, grace, and charm to provide a luxurious retreat in beautiful surroundings with 24 private guestrooms, each featuring wood-burning fireplaces, en-suite bathrooms with oversized soaking tubs and lavish bedding. 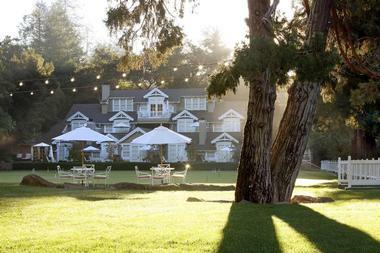 Set within an enclave of lush landscaping, tiled patios and trellised walkways, with lovely views of the first and second fairways of Pebble Beach Golf Links, the resort also boasts a heated outdoor swimming pool, a spacious lounge and billiards room, an invigorating, five-star spa, several fine dining establishments, and a selection of championship golf courses. Nestled amongst rolling vineyards in scenic Carmel Valley just 12 miles from downtown Carmel, the Bernardus Lodge & Spa is a luxury resort and wine estate that offers an unparalleled retreat in the heart of California’s wine country. The luxe resort features contemporary Euro-style guest rooms and suites with plush feather beds dressed in Italian linens, cozy limestone fireplaces, stylish en-suite bathrooms with double soaking tubs, and balconies or patios with spectacular mountain or vineyard views. Suites add lounges and full kitchens, and modern conveniences include iPod docks, Nespresso machines, flat-screen televisions with cable channels, and complimentary wireless Internet. 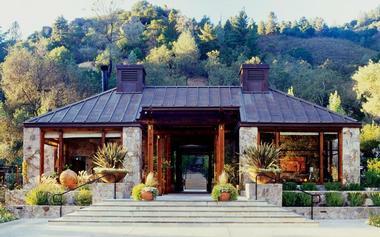 A fine-dining restaurant on the property serves award-winning California cuisine, and the winery has a sleek tasting room where visitors can sample some of the estate’s top wines. Other deluxe amenities include a heated swimming pool, a fitness center, two tennis courts, and a tranquil spa.